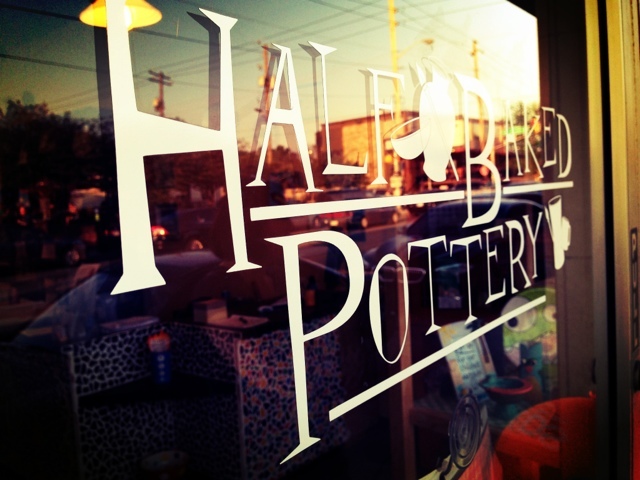 I scored a Living Social coupon for Half Baked Pottery in Broad Ripple. My sisters and I decided to make an evening of it complete with dinner and some window shopping ... such a fun night with two of my favs! 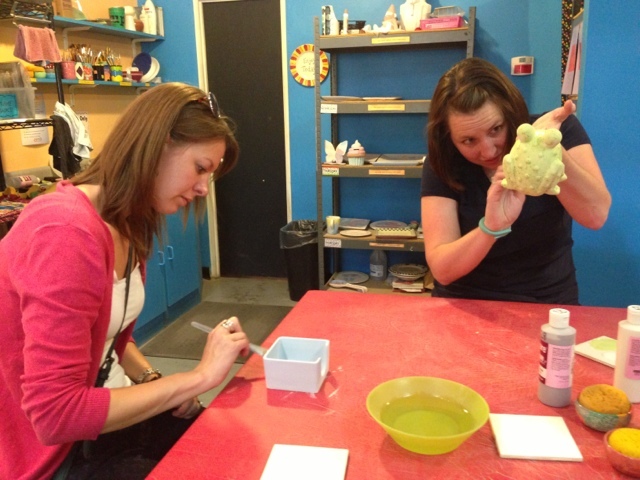 Half Baked Pottery, a paint-your-own pottery studio, encourages people to visit the studio for a creative pottery experience. The studio offers classes and is also open to the public during set hours. 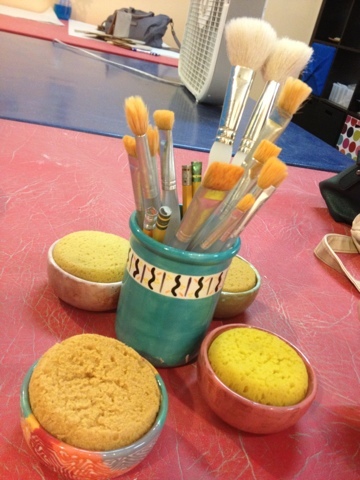 You start by choosing a plain piece of pottery then grab a seat at one of the tables, choose your paints, stencils and paint brushes and let the creativity begin! 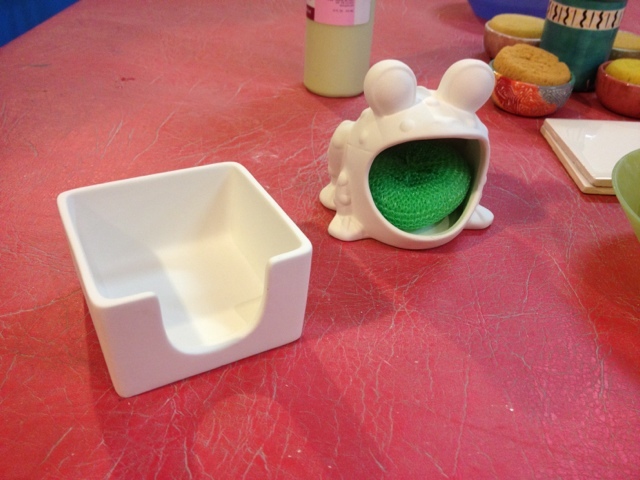 I chose to paint a notepad holder and my sister chose a cute frog kitchen sponge holder - other options included plates, vases, figurines, mugs and more! Prices varied, but I have to say prices seemed a bit high. The notepad holder was only $18, which includes the studio time, paints, firing, etc., but some of the plates and bowls and such were $30-$40 of more. Our Living Social deal entitled us to two $17 items, so we paid a bit extra to paint these items that cost more. The process was fairly intuitive and the possibilities of design are endless. There are shelves setup with paint and paint chips for selecting the right color and a number of tools such as dotters and permanent pencils. 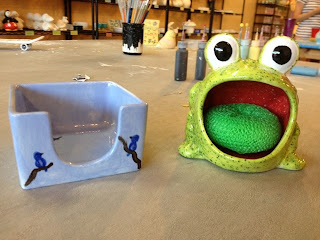 The tables are stocked with brushes and glazed tiles for which to squirt the paint. A water bowl is available on the table for cleaning brushes as well. I decided to paint the background of my notepad holder light blue-gray and add thin tree branches with birds. I have actually painted this theme before for paintings that I did for my bedroom, and I thought it would translate well on this notepad holder. The paint dried very quickly, within a couple of minutes. You could easily layer colors and complete the piece within an hour or two. 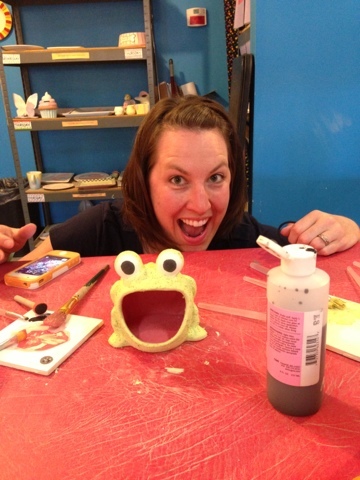 My sister's froggy turned out adorable - she choose a green speckled paint for the outside and a berry color for the inside of the mouth. She used the dotter to create the perfect eyes - it turned out soooo good! 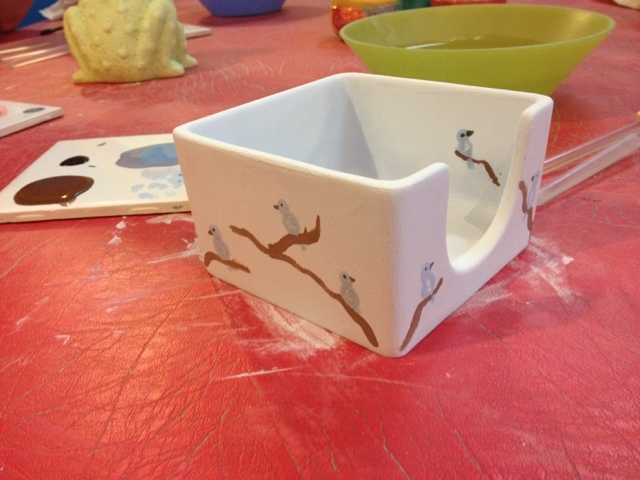 I was also happy with the way my piece turned out - the little birdies resting on the branches complimented the angles of the piece, and I added a few single birds to the inside of the holder for an unexpected surprise thanks to the suggestion of my other sister who elected not to paint a piece. The studio seemed to encourage a social environment and welcomed the three of us even though only two of us were paying customers. 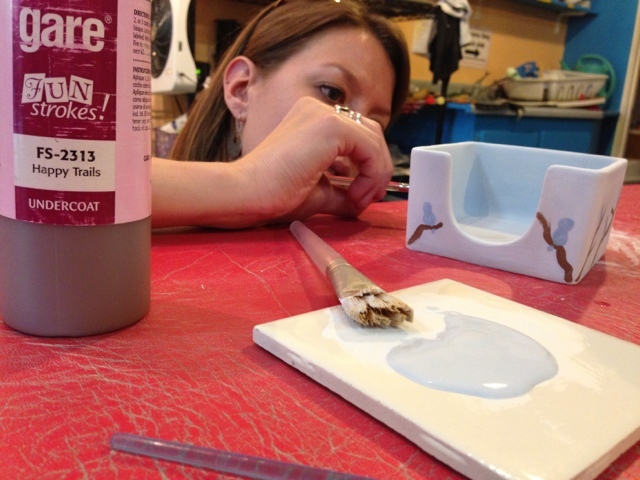 Once you complete your piece, the studio adds a glaze and fires it. The piece is typically ready for pick up within a week. Here are the pieces after the glaze and firing. These steps really enhance the designs and colors and seal the paint for protection. I loved sharing this creative experience with two of my best friends! We shared design ideas, gave each other pointers and had some laughs. We also had a tasty dinner at the Monon Food Company prior to painting and did some window shopping to complete the evening. 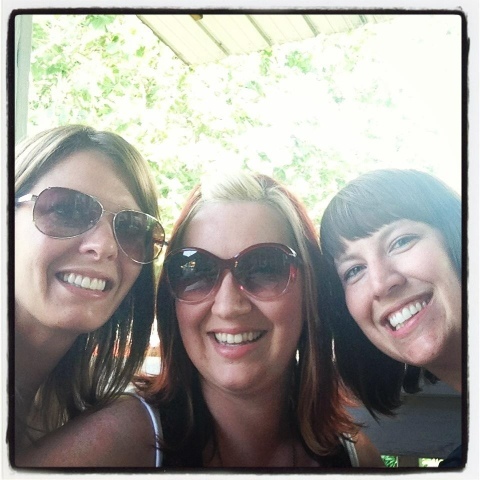 I love my sisters! This experience will likely be one that I don't have the opportunity to experience often, but I will have a memento to keep for a long time. I can see this activity being fun for a group of friends or an individual. There were several children there painting as well - fun for the whole family. The studio had a very casual vibe. The price can be a bit high but considering the time you can invest in the activity, the fact that you create something to take home and its overall uniqueness, it is well worth it!